Expressions of active forms of all p90RSK isoforms were assessed by immunoblotting in Control vs. GR cells following treatment with increasing concentrations of BI-D1870 for 24 hours. Actin was included as a loading control. Samples were processed and analyzed for S6 and phospho-S6 content as described in methods. 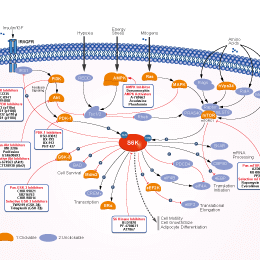 LJI308 is a potent, and pan-RSK (p90 ribosomal S6 kinase) inhibitor with IC50 of 6 nM, 4 nM, and 13 nM for RSK1, RSK2, and RSK3, respectively. LJH685 is a potent pan-RSK inhibitor with IC50 of 6 nM, 5 nM and 4 nM for RSK1, RSK2, and RSK3, respectively. In (E), single (left panel) and double resistant (right panel) SKMel28 cells were treated with vemurafenib, the RSK inhibitor LJH-685 or the combination. Murine DCs were pretreated with PBS or kinase inhibitors (10 μmol/l) wortmanni LY2584702 2 h prior to nicotine (10−7 mol/l) 12~15 h stimulation. MR expression was determined via western blot analyses (C, F). β-actin was used as an internal control.